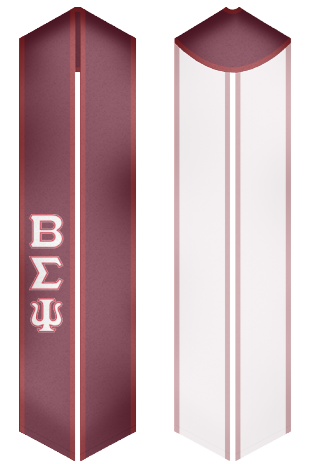 Custom Sash Beta Sigma Psi graduation stoles and sashes. Beta Sigma Psi is a pan Lutheran fraternity and oldest Christian fraternity in the United States of America. It was founded in 1925 at the University of Illinois. The fraternity has over 10 chapters and 7,500 initiated members. The society has numerous famous alumni and being apart of this fraternity is an honor none the less. Use the design tool and create a very special and memorable design for your sash that can be used to make your graduation memorable.